Part of this trip was featured on Equitrekking on PBS and Horse & Country TV! 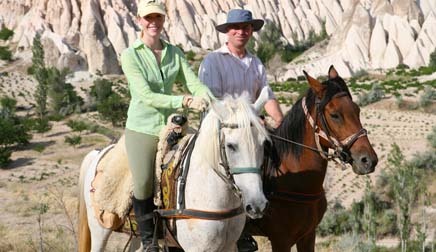 Horse riding Cappadocia combines the adventure, history, culture and nature found in Central Turkey This trip is filled with hidden gems and amazing historical sites. In ancient times the name Cappadocia meant “the land of beautiful horses” and the finest horses were raised in this region. Today, on your adventures through Cappadocia, you’ll ride through ancient villages to meet welcoming local Turks and pass through valleys with stunning rock formations, called fairy chimneys. Over time the soft rocks have been sculpted by erosion from the elements, like wind and water, into shapes which can fuel the imagination and local legend. Be sure to ask about the local folklore surrounding these bizarre formations. On this Cappadocia horse riding vacation, you’ll ride Ride Barb-Arab horses through colorful canyons to old Silk Road Hotels, underground cities, hidden churches and historic villages. All of these amazing sights are in a compact area, so you can ride from village to village on horseback. You’ll eat an abundance of good Turkish food, perhaps in a historic cave or outside in the courtyard. Choose from a variety of itineraries. For those who like to ride horses and camp, there are a few different itineraries. There are also options for horse riding each day and staying in comfortable and authentic pensions and inns each night. These trips are suitable for intermediate riders, who are comfortable at the walk, trot and canter and riding on and off trails for many hours. Please let us know if you have a non-riding companion. There are additional activities for them, like hiking, hot air balloon rides, mountain biking, canoeing and visits to many cultural sites. History and exotic culture abound in Turkey! Featured on two episodes of the Emmy award-winning Equitrekking series on Public Television: Equitrekking Central Turkey and Equitrekking: Turkey's Coast, Cappadocia & Istanbul, which debuts fall of 2010. "Most people experience Cappadocia as a two-day extension via tour bus from Istanbul, but western Turkey is a not-tobe-missed active vacationer’s dream. The “other-worldly” lunar landscapes beg to be explored off the bus by hikers, cyclists, hot-air balloonists and equestrians, away from the throngs of tourists. Five days on horseback, just the two of us and our Turkish guide, allowed us to see this part of the world in an up close and personal way." -- Susan Seligman, Cover Story in January 2011 Albuquerque Journal. "This is the kind of landscape where you can imagine fairies nestling in chimneys, troglodytes living in the underground cities and beings arriving from the moon. Evenings in the courtyard of Kirkit Pension, a pleasant ensemble of restored Anatolian houses built into the rock, are full of fun but also informative. I learn about the Hittites, Turkish literature and different views about the origins of the underground cities. The pension is owned by Ahmet Diler and his Australian wife, Tovi, who met in 1982 in Cappadocia. At that time, the traditional houses in the village of Avanos were being destroyed by the local council for real estate speculation. Ahmet and Tovi organised petitions and more than 100 houses were saved and classified as national monuments. One night we're entertained by gypsy musicians." Please see Equitrekking Travel's General Packing List. The following will be provided to you in Turkey: a horse, saddle and saddlebags. Notes on Tipping. We frequently get asked about tipping for this trip. In 2011, guests tipped 100 Turkish Lira for the guide and 50 Turkish Lira for the driver for this vacation. Tips are appreciated and the amount is up to you! Sure-footed Barb-Arab horses the size of double ponies, energetic, but calm for Cappadocia horse riding. Your choice of either English saddles or saddles from Kyrgyzstan, comfortable sheepskin saddles with a higher tree so that the rider sits a bit higher off of the saddle. Non riders might enjoy our other area activities including hiking, hot air balloon rides, mountain biking, canoeing and a visit to see the whirling dervish ceremony. Many old Cappadocian homes have been comfortably restored for you to experience the atmosphere of a traditional home. They're often partly carved in the rock and over what was intially underground cities. Three meals a day included during the riding portion of the tour as indicated on each itinerary. The food is tasty and fresh. Vegetables and fruits seem to have so much more flavor in Turkey than in many parts of the United States. They have that home grown flavor! Vegetarian options are available. Please let us know if you have special dietary requests before your trip. Piping hot Turkish tea, coffee, bread, butter, olives, tomatoes, feta cheese, honey, local jams and specialties and sometimes eggs. Open minded, curious, generous and good-humored traveler who knows how to participate in a group to create a good atmosphere and knows how to appreciate the customs and the novelties he or she will be seeing. The accommodations are B&B’s in spring and autumn and as of mid june, guests camp. Single Supplement for all rides start at $208 USD*, depending on the accomodations chosen. In Cappadocia over the centuries, the erosion of volcanic rocks has formed a surrealistic breathtaking landscape. Here’s a 6-day ride through the valleys and unspoiled villages of this region to discover troglodyte rock churches underground cities and fairy chimneys. Arrival in Kayseri or Nevshir via Istanbul. Shuttle bus to Avanos (app. 1 hour). Dinner and night in a restored traditional Anatolian guesthouse. Comfortable double or triple rooms with ensuite bathrooms. First encounter with the horses and the guide and departure after lunch. Having crossed the longest river in Turkey, the Kizilirma kto reach the 13th century caravanserai of Sarihan. Riding along the old trade trail that crosses Turkey all the way to China, we’ll arrive in Devrent Valley, where some of the rock formations are shaped like animals. We’ll ride in front of the amazing Cavusin cliff, full of cave dwellings. We’ll then go through the pictoresque valleys of Gulludere and Kizilçukur. These valleys are made up of tuffa, a brittle soil, with colours that vary from pale yellow to ochre, to light green and pink and are sometimes wavy like meringues. We’ll head up onto a plateau towards the traditional village of Ortahisar, built around an impressive rocky outcrop. Riding through other beautiful valleys of Cappadocia, we arrive at Keslik. We ride through a valley dotted with fairy chimneys to the village of Taskinpasa (1150m of altitude) where we visit a mosque from the Mongolian era. Riding through cereal fields, we’ll head towards Mount Hodul with beautiful views over the Erciyes the volcano that millions of years ago made Cappadocia what it is. 6 hours of riding. Winding among the gardens and vineyards of Boyali, we go up on Topuz plateau to arrive at Sofular. We’ll then wind our way on a small path that leads us to village of Bozca. 6 hours on horseback. Another path along the banks of Kizilirmak river will lead us to the hot water springs of Bayramhacili. We’ll ride along Göynük river to get to Ozkonak (1300m of altitude) where we’ll visit an underground city where the early christians hid in times of danger. Then we’ll slowy climb up Mount Idis (1700m of altitude) for a great final panorama over the valleys of Cappadocia. Return to Avanos. 6 hours in the saddle. Depending on your flight schedule, free time and then shuttle bus to the airport and outgoing flight. Optional hot air balloon flight at dawn over the amazing landscapes of Cappadocia, around 4:30 AM. Possible day 2 or day 3. This is the first chance I've had to thank you for the fantastic trip you organized for us. It's been like whirling Dervishes ever since we got back and so have had no time to write. Cappadocia was incredible, nowhere else remotely like it. Your advice - to hire cars, stay in Selcuk and the like - was just right. Everything you arranged went like a dream - flights, hotels, car hire - the lot. So thanks very, very much. The trip was amazing. We loved every minute of it. All the arrangements you made were perfect. All of your colleagues at Kirkit did a wonderful job. Everyone went out of their way to make our experience memorable. Special thanks to Onal for all the trips to the airport. I cannot say enough about how much fun we had and how much we hated to leave. You all do a fabulous job. Just a quick note to let you know how much I enjoyed my horse-trek thru Cappadocia. Everything was great - smooth pickup at the airport, the lovely Kirkit Pension in Avanos, great traditional music after dinner. My guide Cuneyt was wonderful - he was enormously patient with my lack of riding skills (!) and very good at pointing out all the wonderful sites of Cappadocia. The night spent with the family in Ibrahim Pasa was memorable - delightful and charming people; we manage to communicate despite the lack of language. Cappadocia is really unique on the planet and by horse is definitely the way to see it. Could certainly not have done this without your help - thanks again. Just got back from our riding tour in Cappadocia, and I had a ball. It's a fabulous place and the people are very hospitable. The team there, Ender (our riding guide), Ali (our driver) and Anifi (the best cook in Cappadocia) served us like "queens". Thanks to this tour, I discovered "paradise" on Earth and of course, like everyone else, I found it too short! The tour was very good, very professional with horses in great shape, the guide was very capable that organised a tour punctuated with cultural visits as well as the natural beauty of the site. What an amazing week! Pure happines! It was hard to leave, the week went past so fast. I think that it's the most beautiful trip I've had. Thanks for everything. The team is wonderful and very professional. The horses are very nice and resilient-- getting back to work is so hard! Known as the cradle of civilization, Turkey draws travelers from around the world with its rich history. Yet it also attracts those looking for contemporary outdoor activities and sophisticated dining and lodging. This new full-color edition of Fodor’s Turkey focuses on the best the country has to offer. This volume shows Turkey at its best, from the beautiful beaches and azure seas to the glittering mosques and churches, intriguing historic quarters and colourful bazaars. In-depth coverage is given to Istanbul with the help of cutaways of ancient buildings, pictorial maps and 3-D aerial views. This award-winning guide also helps you to discover the treasures of this ancient civilization, with in-depth coverage of many archaeological sites, including the classical ruined city of Ephesus and the cliff-side troglodyte village at Uchisar. From Publishers Weekly-- In an exotic, engaging journey deep into the heart of Turkey, Settle, who won a 1978 National Book Award for her novel Blood Tie (set in Turkey), revisits a country where past and present are everywhere intertwined. Contradicting the unflattering Western stereotypes of Turks, she depicts a people she admires for their capacity for friendship, their essential warmth and honesty. Istanbul, noisy and frantic, is also "as polite and friendly as a country village," and tough-skinned rural folk are "almost naively gentle" beneath their exterior harshness. Settle's hauntingly poetic evocation of a people and place is filled with moments of quiet rapture as she inspects the remains of ancient kingdoms, retraces the paths of Seljuk sultan Aladdin, dips in thermal baths and views mosques and churches, castles, sphinxes and the prison where Nazim Hikmet, Turkey's finest modern poet, was imprisoned for his work. A passionate love for the Turkish people and an optimism that its ruling class can complete Turkey's transformation into a Western-style democracy mark Kinzer's reflections on a country that sits geographically and culturally at the crossroads between Europe and Asia. Kinzer, the former New York Times Istanbul bureau chief, gives a concise introduction to Turkey: Kemal Ataterk's post-WWI establishment of the modern secular Turkish state; the odd makeup of contemporary society, in which the military enforces Ataterk's reforms. Kinzer's journalistic eye serves him well as he goes beyond the political, vividly describing, for instance, the importance and allure of the narghile salon, where Turks smoke water pipes. Here, as elsewhere, Kinzer drops his journalist veneer and gets personal, explaining that he enjoys the salons in part "because the sensation of smoking a water pipe is so seductive and satisfying." Readers who want a one-volume guide to this fascinating country need look no further. Intermediate. Comfortable at all paces. Walk, trot, canter in a group. On some trips, you should be able to saddle and unsaddle your own horse. See "Itineraries" tab above for rates and dates. See each itinerary for discounts for larger group sizes. Saddles from Kyrgyzstan covered in comfortable sheepskin. Some English trekking type saddles available. Sturdy sure-footed Arab or Barb-Arab horses the size of double ponies. These horses are energetic but calm. 17-years-old if alone. If accompanied by parents, 12-years-old. Your base cities of Avanos and Guzelyurt in the region of Cappadocia have warm days and cooler nights. Guzelyurt is at a higher elevation, so is cooler than Avanos. Over the course of each year, Cappadocia receives very little rain. In the summer, it’s hot during the day 77º to 96ºF (25/35º C) and cool in the evening and at night 50º to 59º F (10/15º C). The altitude, between 2952 and 5578 feet (900 and 1700 meters) and the seasons determine the temperature. The weather is generally nice and dry but there can be occasional heat storms. Spring can be cooler and wetter.